Athur Eloesser was born in Berlin near the Alexanderplatz. He studied history and wrote a doctor's thesis on the work of Molière. His academic career failed because he was a Jew and in 1899 he became a theatre critic at the Vossischen Zeitung. In 1904 he published studies on Heinrich von Kleist and on French literature. From 1913 until 1920 he managed the Lessingtheater in Berlin. During the twenties he wrote biographies of contemporary writers. When the nazi's came to power he was forced to leave the Vossischen Zeitung. His books were burned and he was forbidden to work. From 1934 until 1937 he lived in Palestina, but in 1937 he returned to Germany, where he died in 1938. His wife Margarete (born Nauenberg) was deported to Riga in 1942 and died there. 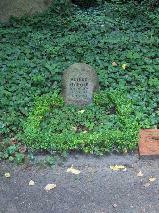 The grave of Arthur Eloesser at the Wilmersdorfer Friedhof in Berlin.